Artificial muscle, shown above with the capability of using a screwdriver, is a simple device based on the human muscle, only instead of using contracting muscle tissue it uses a rubber tube bound by woven high-tensile fibers. Using robots to handle disaster situations not suitable for humans is not new, but the problem remains on how to build robots light enough to move about easily, yet strong enough and tough enough to handle things like a damaged nuclear reactor. That is where a new hydraulic robotic muscle comes into the discussion as it is lightweight, yet five to ten times as strong as conventional electric motors and more durable, said researchers at the Tokyo Institute of Technology who are working with Bridgestone Tires on developing the project. The locations in disaster areas where the responders are needed most urgently are often the ones that are the hardest to get to. The 2011 Fukushima nuclear disaster is a perfect case. Despite the damage done to the nuclear power plant by the sea wave that struck it, the subsequent explosion and meltdown could have been avoided had emergency workers been able to reach it with the right equipment in time to make repairs and re-power the cooling systems. This is one reason why robots are so attractive. Autonomous robots have the potential to be able to move in and handle such emergencies, even to the point of using found tools and vehicles to accomplish tasks. Unfortunately, even though robots have a reputation for being steel giants possessing superhuman strength, mobile robots tend to be more on the weak and fragile side. Developed since 2014 as part of the Impulsing PAradigm Change through disruptive Technologies Program (ImPACT) Tough Robotics Challenge, an initiative of Japan’s Cabinet Office Council for Science, Technology and Innovation, the new hydraulic muscles may be one way of making stronger, more robust robots that are lightweight and capable of precision movements. The expectation is the mature technology could one day produce that smallest, lightest, and most powerful consumer robots ever created. The team said the key to improving disaster response robots is to produce tough hydraulic actuators, which are the components that move and power robotic limbs. Most actuators are electric, but they lack precision and have a poor strength to weight ratio. On top of that, they are susceptible to shocks and vibrations. 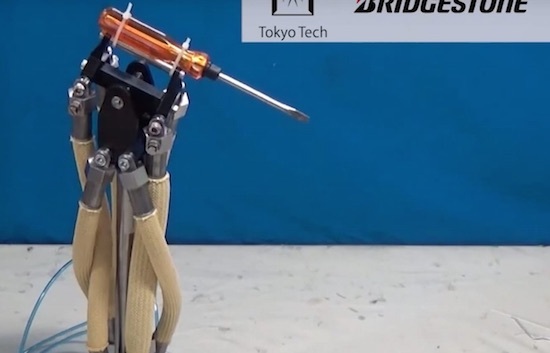 The Tokyo Tech/Bridgestone artificial muscle is a simple device based on the human muscle, only instead of using contracting muscle tissue it uses a rubber tube bound by woven high-tensile fibers, which contracts in length as its pressurized with hydraulic fluid. The combination of rubber and fabric gives it a structure like that of the human artery, so it responds dynamically as pressure ends up applied and released, allowing it to move smoothly and precisely. In addition, it has a very high strength-to-weight ratio. Another aspect of the simple design is the muscle is very tough and resistant to shocks and vibration. This makes it suitable for hostile environments and for high-intensity jobs, like pushing down walls or clearing debris. Producing the muscle required the development of a new oil-resistant rubber that also has excellent deformation characteristics, the researchers said. The sheath needed a new technique for weaving high-tension chemical fibers, and the tube ends required special tightening to resist high pressure without leaking. The result was an actuator five to ten times the strength-to-weight of electric motors or solid hydraulic cylinders. The researchers said they will continue development of robots based on the new muscles, as well as a consumer-use robot actuator.